I'm back with another video tutorial and review. I'm sure many of you are probably familiar with the mineral makeup company Everyday Minerals. They recently contacted me to review one of their palettes from their Lavendar Collection. I remember ordering from them back when I first started my blog when everyone was obsessed with mineral makeup, lol. I think they were one of the first to give Bare Escentuals a run for their money with affordable, high quality mineral makeup. Today i'll be reviewing the Lavendar palette. To see my review and tutorial, click here for more! Check out video review and tutorial. I created a 2 minute soft, smokey eye using these plum shades. Super easy! First off, I'll openly admit that I'm not a huge fan of loose pigments. While I find the color and payoff beautiful, I get tired of the loose powder and mess. I'm a fan of pressed shadows because they're easy to store in palettes and I find myself reaching for them more than pigment jars. Everyday Minerals has solved this problem for me. They developed this ingenious idea of putting together loose mineral palettes in these palettes with pop top pigment storage wells. Loves! You dip your brush into the hole and then swirl off the excess in the circular area around it. The palette also comes with a mini bamboo brush if you need something small to fetch out the powder. They offer these palettes in a range of colors. In terms of the amount of product, there's not a huge amount in each well, but a little pigment goes a long way. These soft pinks and purples are great for spring. Check out my swatches (dry without a base). I played with these colors a lot, trying them wet and dry and with different color bases under them. At first glance, I'm liking the color options. The shades go really well together. When I swatched them, I found that they are all matte for the most part (except the second shade with a tiny bit of shimmer). Matte pigments can definitely be harder to work with. The key is to apply the color in layers, pat pat, then blend. I found the lightest color a bit ashy on my skin tone so I pretty much avoided that one. I recommend applying this to the brush and then swirling it on the back of your hand to get an even amount of color. It took some practice, but I got these to work for me. This palette retails for $10 at www.everdayminerals.com which I think is a steal! i would to win the everyday minerals lavendar palette so that I can recreate looks that are unique yet bold. the opportunity for me to win this palette would help me to have a variety of different looks of purple. wow. gorgeous and easy look! a lot of the time, i don't use purples cause i'm afraid i might make myself look like i have a black/bruised eye. lol. anyways, this palette would be a great addition to my sad make-up collection. i'm trying to build my collection slowly. and hopefully i can try to do this everyday! I'd like to win because the palette is very cute and I love how your look came out. Wanna try it! I want to have this, that are high quality. I'm your subscriber in you tube and new follower here in your blog..thank you! I would like to win this palette because the colours are not too intense so it's very wearable for everyday. I also find purples really flattering for my brown eyes. I would love to win this everyday minerals lavendar palette because my favorite color has always been lavendar. 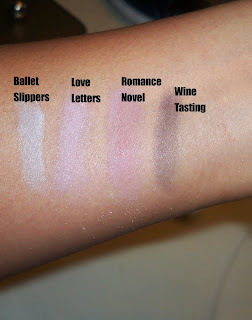 I think it is such a gorgeous color and your swatches show the beauty in the purples included in your review! I'm a big mineral makeup fan. I used EM quite a number of years ago and found the eyeshadows to be not very pigmented. I have since moved onto MAC e/s but this new palette with the wells sounds very interesting. Would love a chance to try it out, plus it's purple which is one of my favorite colors for brown eyes. I am semi new to makeup and I dont have a large collection of makeup at all. 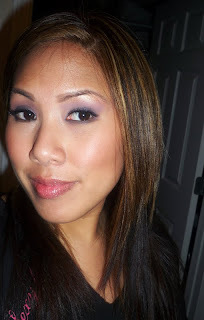 I loved the video you created for this Lavender Palette and I would love to win as well. Thank you. i'd love to win because i'm a make-up addict and who doesn't love to win and expand my tiny collection! I love everyday minerals and have actually ordered from them about a year ago . I still have 4 eye shadow pigments too. Like you I think they are messy but are still good quality . I would love to win the palette they are offering .Thanks . b) this color i think would look great on my skintone, i've never tried colors like these and it looks great on you so i'm hoping it'll look the same on me! I would love to try this brand.. the palatee is an awesome idea!! RenRen,like yourself I rarely go for minerals too often because of the excess in mess, however, I find this company has created an innovative way of making makeup applicatios w/ minerals less of a mess or hassle. I'd love to win this palette because I can use it for my own personal use when i'm on the go. I like minerals because they are light,airy and healthier for my sensitive skin but I want to prevent myself from getting it all over my clothes or my makeup station. I also want to be able to introduce my clients to this new product because I'm sure this "new" packaging will make the forget their "messy mineral" days and go w/ the new and improved. Thanks for allowing me the opportunity to participate in this giveaway. I love to win this..thanks for this great opportunity...I'm starting collecting make up...hope i can win.. I would love to win this, because it looks really nice! I want to win because I want to build up my kit! I would like to win because I would really want to try this palette. I would love to win this palette because the colours look beautiful and I am severely lacking in variety of makeup. I am always too scared to go for unique colours or anything but neutrals and this would be such an awesome prize to win! I would love to win this palette because well first off I have brown/hazelish eyes and these colors make my eyes pop. I would also love to try out Everyday Minerals, definately will buy from them if I have a good experience. Thanks for this oppurtunity and take care! This kit has such pretty colors! I'm usually into neutral colors, but this kit would help me add some fun color to my everyday look. Thanks for the giveaway! I'd love to win one of these palettes! I love EM shadows but the whole loose mess it creates is a downer! Great look you have by the way! i would like to win because i love purples! i would like to win because I love make up! I've heard good things about everyday minerals...and would love the opportunity to try the shadows out!...thanks! I love these colors, and I've never tried mineral makeup before! I'd love to win!!! Beautiful colors, I'd love to try these shadows from Everyday Minerals. I'd love to win because I don't have access to mineral makeup in my country other than some drugstore brands. And the colors are so beautiful! I'm a huge fan of EDM, i am currently using their mineral foundation everyday for 3 years straight! I would love to try this new palette. I never really tried their e/s. I would love to win this palette because I love the palette design and i would love to try mineral eye shadows. Please enter me to this giveaway. I would love to win this because I am trying to expand my makeup collection. i'd like to win because i want to recreate the look in your tutorial. omg, I would love to win this palette because I love purple & it looks amazing on my tanned skin! I've never tried everyday minerals and would love to try it! I'd LOVE to win this because I need new makeup & the colors are AMAZING! I would love to win because I am new to using matte eyeshadows, and these look gorgeous. I'd love to play around with these! Also I'm very hesitant about online shopping so this would be a easy way for me to try them out and see if they'd be worth ordering. I'd love to win because i have never tried mineral eyeshadows before and it's hard for me to get access to EDM in my country since it is not commonly found here :) I'd also like to try out lavender looks since it'd be something different from my everyday neutral looks! I would like to win this because I just can't get over the unique way the mineral palette is made. Who would have thought to put loose mineral powder in that way. It is truly genius. I want to also create the look that you did with the purple palette. Your tutorial is so simple that anybody will be able to pull it off. If I will this palette will definitely be ordering more from the company. 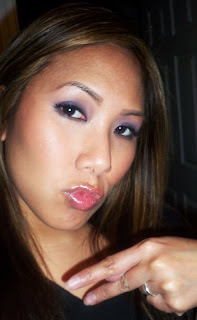 l'd love to win the EM lavender palette...I a a purple junkie...I love anything and everything lavender/violet/purple! i'd love to win this palette. purples are my favoirte shades and they compliment brown eyes so well. i've also seen great reviews on everyday minerals. i'd really like to give them a try. thanks! Hey Ren Ren! I would like to win this palette so that I can try the everyday minerals makeup. Always wanted to try it, but didn't want to regret my purchase. After seeing your review I'm interested to see it first hand and play around with this. Thanks again for the giveaway! I'd like to emulate this look, I have similar shades of levander but this ones from everyday minerals seem really to have higly pigmintation. I hope to win. I'd love to win! Beautiful colors. i'd love to win!!!! such pretty colors!! I want to win because I don't have any pigment makeup. I would love to win this because the colors are so pretty. I have never owned or tried any type of loose eyeshadow or mineral make up but I really want to. I have brown hair and eyes so these colors look great on me! Thank you so much for the review and contest! i would like to win because i have recently been interested in mineral makeup but havnt tried any eyeshadows. i also love the colours in the palette! I would love to win b/c purple is my favourite colour, especially for eyeshadows. I find that purple eyeshadows are as versatile as neutrals: it can be simple and low key but it can easily turn into a really bold look. i would like to win because i dont have a lot of money to buy the palette. i think the colors will look great on me too!!! Thank you for the opportunity to win the Everyday Minerals Lavendar Collection! I have never seen anything like this and am just starting to enjoy collecting make-up. It would be a great addition! I wouldlike to win the palette because I have green eyes and the laverder palette would be ultimate palette to emphasize my eyes. I'd like to win because I absolutely love the look you did with this pallette and would like to do that look. I would like to win this palette because the colors are beautiful and I've never tried this product line. I would like to win the Everyday Minerals eyeshadow palette because the packaging is very interesting and I've never tried any EDM products. THanks.. I would like to win this palette because i haven't try any mineral e/s .. and they are very cute..
i have never used mineral based eyeshadows.I have always thought of them as being messy. This looks very interesting! I would love to win this because I have never tried a mineral palette and this seems like an awesome palette. Thanks for the review. I would like to win because I don't own many purple eyeshadows and I want to try a purple smokey look. Your makeup looks are always so gorgeous =). I would love to win this pallet so i can recreate this look its soo pretty. Please pic me. I would like to win this giveaway because I would like to try the look that you have created ! you always look great and i love your explanations ! I'd like to win because I've never tried out mineral eyes shadows and would like to try them. i'd love to win the palette because it'd be a good way to expand my collection, i'd love to try it out so that if it's something i enjoy, i can purchase the other palette from everydayminerals as well. Thanks for doing another tutorial! I really liked the look you chose to do with that palette, and the colors are good for the transition between winter and spring! Yay! Pink and purples are SO CUTE! I would like to be entered to win the palette! Thank you for being awesome and doing your reviews and giveaways! I would really love to win this palette it would really help me start doing makeup tutorials. I also would like to start trying the mineral makeups! I would love to win this palette because I LOVE purple and get the opportuity to try out this line. Thanks for this opportunity. I like this subtle purple look on you Ren! I'd love to get a hold of this palette. I've tried EDM foundations before, but I haven't tried their shadows yet. Been hearing quite good things about them and I would love to test them out! I am loving your videos! I would love to win this pallet. One because the colors are great and its so unique! Also because I am an aspiring free lance artist but since I'm a single mother I don't have extra chash to put into building my kit. I love finding lines that are affordable and high quality. I am inspired by Make up because of the way it makes me feel Like a powerfull woman. Even when my I'm feeling down in the dumps or beat down by life. Thanks and keep up the awsome work you are inspiring woman and helping us build our self confidence wich is an amazing thing! I'd love to win this palette because I love purple eyeshadow! (Next to my neutrals of course :) Have a great day, Ren! I would like to win because I knew that the everyday minerals products are safe and not contained dangerous ingredients. OMG. Of all your give aways this is my favorite so far! It's perfect!! I love pigments. And those colors look perfect. I feel those shades would fit me very well! uld love to win this palette because I don't really have a very big make-up collection so any help with building it up little by little would be great..=)..plus I love purples..
woohoo! i love purples and would love to try the palette! I would like to win because I never tried EDM! I'd like to win because I would to pursue a career as a makeup artist and want to have a bigger makeup collection. i'd like to win b/c I love everyday minerals! I'd love to try this out. I love pigments because I always get such good color payoff with them. When I use pressed they colors seem dull and muddy to me. But I travel a lot and find pigments do NOT travel well. The jars I have (mostly the sample size from PureLuxe) almost always become a little unscrewed so that powder 'leaks' out around the edges and coats everything. This seems amazingly travel friendly! Right up my alley! Wow such pretty purplecolors. I am horrible with loose pigments too i make such a mess but this looks cool id love to win. I'd like to win because I basically am a makeup fein hehe and would love to own this pallette. As you said in your video some people are scared to wear smokey eye look. I like a little more natural looking yet still dramtic and tutorial showed how to do a lovely easy lavendar smokey look I think I could do. I'd love to try it out!! I would love to win this because seeing that this was an Everyday Minerals post (I am in love with Everyday Minerals), I decided to finally make a blog and follow you so I can enter the drawing! I would love to try this palette because I have never tried this brand! I love the colors. They look make me think of petals. Perfect flowery look for spring! Snow is just starting to melt and now I can celebrate with blooming eyes! I would so love to win this, i never ever win anything and i love love love Everyday Minerals. They are my favorite line! I have seen so much products from Everyday Minerals, but I was not have a chance to try it out. I really want to win this because it is so awesome for it packaging. I love the idea so much. amazing. And purple is such a gorgeous color. I love it. Please enter me, This is such a beautiful eyeshadow palette and I love purples and its something I can definately wear everyday. I would like to try EM eyeshadows because Ive never tried them before. I would like to win because I love Everyday Minerals!! I would love to win b/c minerals are hot hot hot! I'm a college student that has to spend hundreds of dollars on biology and chemistry textbooks so sadly I never have extra money to splurge on makeup. Sad panda :( I'd be grateful to win. it would be so awesome to win this palette, so i could at least try to look as beautiful as you sugah! I loove mineral eyeshadows, especially purple! Very pretty! I don't often get lucky. Yesterday my friend found a 20 bill in an ATM while we were out and I managed to lose my phone. Sigh. I would love to be a winner of this amazing set! I would love to try this product. I have not really used mineral products before, that it would be cool to win it and I love the colors. I would love this palette because I just started getting into makeup and I think the purples will be beautiful and natural for a beginner! its soooo nice color to work with suit everyday to school perhaps. i would like to when this eyeshadow palette because those colors looks gorgeous. on top of that, it's a really cute palette. never see nothing like it. 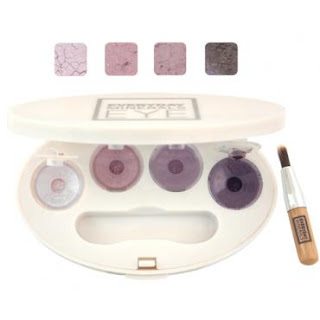 first and foremost I would love to win this everyday minerals lavender pallet because I am forever in love with the shades of lavender/purple and would like to try a mineral makeup for the first time. I think you are fabulous, and I loved your tutorial for the palette that you are giving away. I would love to be entered to win it! Thank you so much for doing your tutorials and giveaways! My e-mail is ashtontate323@yahoo.com and my YouTube account is ashtontate323. I would like to win the everyday minerals palette because I never tried their pressed eye shadows before. I am impressed by their blue and foundation so I want to check these eye shadows and see if they are just as good. 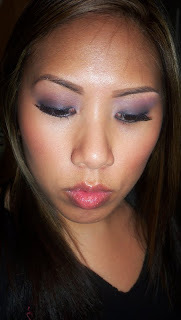 I simply love using shades of purple and the effects you've shown have really piqued my interest in trying them out! Ren, Id love to win this palette beacause it too cute and purple is one of my favorite eyeshadow color. Its so compact too! I'd like to win because I would like to try out this brand. I'd like to win because purple is my favorite color and would like to try to pallette.